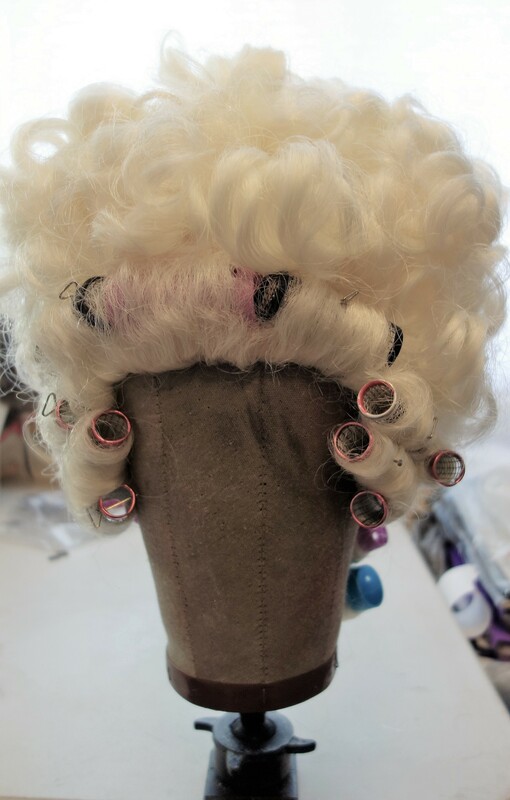 I'm designing an open-access online Moodle course in wig styling, and I'm feeling particularly proud of myself having finished the first written tutorial. These things take a lot more work than it looks! So I decided to share the 'work in progress' with you. Please forgive any clunky formatting, which is partly due to transferring it from Moodle and partly due to my substandard technical skills! When reading through, you'll notice that you're sometimes referred to other pages like 'Tools and Techniques'. These pages haven't been written yet. When the online course is live, there will (hopefully) be links back to them. Finally - Since this is a synthetic wig, I've used a steamer to set the curls. (I'm pretty sure that these pre-formed wigs are never made with human hair). Steamers come in a variety of sizes from small hand-held ones to industrial models, and are usually marketed as steam-cleaners or clothes steamers. One of the downsides of using one of these types of wig is that you will be choosing the resources you use for reference to suit the wig and not the other way around. In this case, the pre-formed wig is in a rounded style rather than being high and narrow, so the reference used has to be the same. These types of pre-formed C18th wigs don't fit close to the head like a normal wig. The wig foundation itself is formed into a dome shape and the wig is either held onto the head because it fits snugly around the base, or there is an internal structure which keeps the wig at the correct height on top of the head. The benefits of this kind of wig - they are relatively cheap and are easy to style. The drawbacks - unless there is enough wig hair to soften the front, there is often a hard line at the hairline. The wig may be unstable when on the head, and have to be securely fastened using bobby pins. The wig comes pre-curled, and you could conceivably use it as it is - but it's messy and not particularly right for the period. Around the face the curls are particularly short and tightly curled. The curlers around the face and the long ringlets at the back were re-curled using rollers. In all cases the rollers were set in the direction that the resulting curls were to be. (See tips on using rollers in Tools and Techniques pages). Since this wig is synthetic, it was then steamed to set the curls. The base netting of the wig shows between the curls (sometimes called curler breaks). To combat this, the curls are backcombed at the roots all over the wig. (There's more information on back-combing in the section of the course 'Techniques'). The rollers at the front and the back were removed. In the case of the long ringlets at the back, they were removed sideways, so that the hair fell in ringlets. The curls are pulled into the right direction and firmed up by combing around a finger and spraying with hairspray or a styling spray. An alternative way to do this is to smooth the curl around a dowel or rod, but I find it easier to handle if I'm using my fingers. The front of the wig was combed upwards. At first small curls were pulled down to soften the hard edge, but it looked better with them all pulled back. Decorate the Wig anyway you like!